Venus enters Aries February 3, 2016 at 15:51 UT (or 10:51 am EST). Due to an upcoming retrograde, and with respect to the features of this particular synodic cycle, it will actually remain in Aries until Jun 6th — aside from a 3-week retrograde back into Pisces in April. Venus is said to be in detriment in Aries, as it is the sign that opposes Venus’ natural ruler, Libra. Traditional or Classical astrology places a lot more emphasis on planetary detriments as they are seen as significant in Classical practices. There are said to be some disadvantages to having a planet in detriment, usually due to societal norms and expectations rather than any deficit in the archetype itself. But there are also a lot of wonderfully unique attributes associated with this placement as well. If you happened to have been born with Venus in Aries, you’re probably known as someone who is exceptionally passionate and ardent when it comes to matters of the heart. You probably fall in (and out) of love quickly. You consider yourself a bit of a maverick where love and relationships are concerned. You wear your heart on your sleeve, express your feelings openly, and are not afraid of a little competition. Venus enters Aries April 5, 2016 at 4:50pm UT. Venus is said to be in detriment in Aries, as it is the sign that opposes Venus’ natural ruler, Libra. Traditional or Classical astrology places a lot more emphasis on planetary detriments as they are seen as significant in Classical practices. There are some disadvantages to having a planet in detriment, usually due to societal norms and expectations rather than any deficit in the archetype itself. Today is a good day to connect (or reconnect) with loved ones and focus on putting your differences aside. It represents people gathering together to connect, interact and socialize. It’s a happy, joyful energy that can manifest as a party or celebration, or it could be as simple as a girls’ night out. 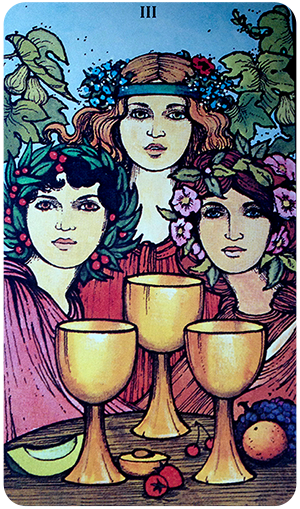 There’s a strong sisterhood vibe to this card — as well as most other versions of the Three of Cups — too. Pay attention to new people coming into your life too. You could find yourself developing friendships with people that seem random at first but can turn into important connections over time. Today you want to focus on what’s right in your world rather than what might be wrong. The Sun card is all about happiness, optimism and vitality: it’s about being present in the moment and celebrating being alive. Look around you and take notice of the blessings that surround you. Step away — at least mentally — and turn your attention away from work and mundane affairs long enough to soak in the energizing rays of the Sun. 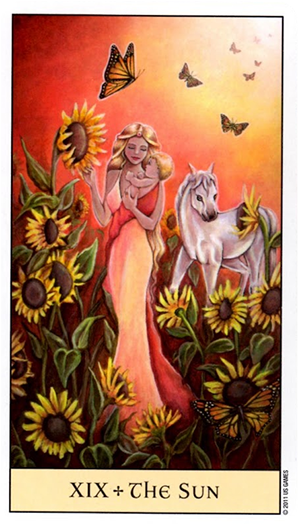 The Sun card — this version from the Crystal Visions Tarot — represents energy and vitality. Feeling happy to be alive. Getting in touch with your inner child, your true authentic spirit, the part of you that longs to embrace life with ever fiber of your being. 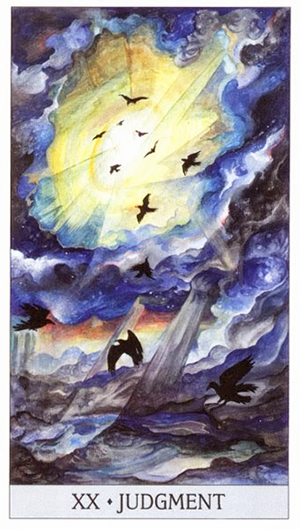 The Sun card in the Tarot is much the same way. It refers to the wonder and glory of being alive. Of feeling warm, confident, radiant and spirited. Its attitude is that “everything is as it should be” today, for you and all around you. Today’s card — the Two of Fire, the Vision Quest Tarot’s version of the Two of Wands, speaks of drawing on your inner reserves of self-confidence and initiative to make something happen. The Two of Fire asks, “What are you waiting for?” and “why are you holding back?” It tells you there’s no time like the present to put yourself out there and take at least the first steps toward pursuing your goals. You may not have fully fleshed out your ideas. And that’s perfectly ok. 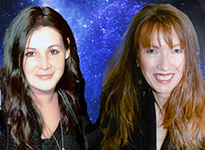 The Two of Fire speaks of putting something into action that will gather momentum over time. It encourages you to expand your horizons and reach for broader vistas. It speaks of taking a look at your long-term goals and acting on them with courage and conviction. If you’ve been hesitating due to fear or uncertainty, now is the time to put those worries aside. You’re already seeing how some moves are paying off, and are now in a position to take things to the next level. 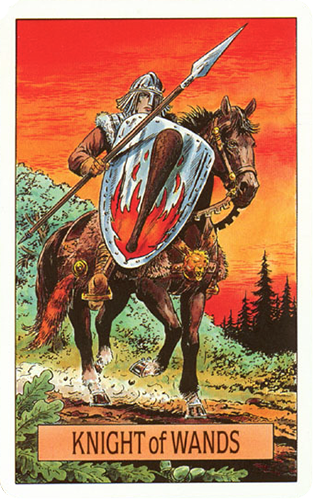 The Two of Fire says that all you aspire to is now within your grasp; you only need to gather up the courage and confidence to go after it. Today’s Mars / Uranus opposition may have you feeling like you’re swimming against the tide, or like you’re surrounded by turbulent waters that are rising all around you. 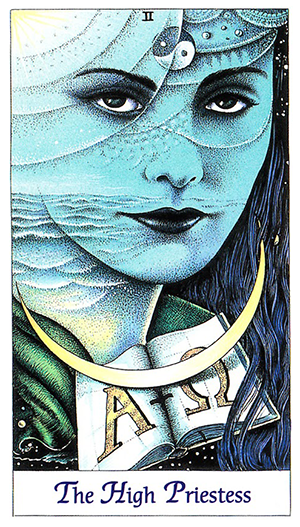 But the Venus / Neptune trine offers a peaceful respite, as seen in the imagery of this card. The waters may be swirling all around the Tiger — and raging in the background — but he doesn’t fight against the current; he surrenders to its movement finds a place of calm in its center. This is the Feng Shui Tarot’s version of the Ten of Swords. 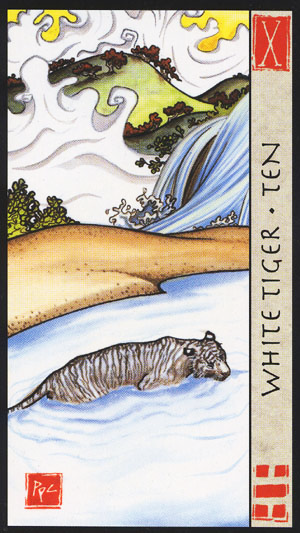 It’s called the White Tiger Ten in this deck, a reference to the completion of the Tiger’s tumultuous journey. Surrender is a big factor in this card. Surrendering to the knowledge that what you may have wanted so desperately was not what you needed at all. As the Ten of Swords is often tied to fighting a losing battle — and ultimately giving up the fight — there’s a sense of liberation that comes from cooperating with the Universe rather than pitting yourself against it. This is the essence of the Venus / Neptune trine. Going with the flow, finding creative solutions to your problems and aligning yourself with unseen forces. You may have to concede to a few losing battles, but you’ll also want to look at how it’s brought you to where you are today. Are you not now a stronger and better person as a result? Take some time to put the past behind you and focus on what lies ahead. You may see all that’s led you to this moment as a blessing in disguise, as long as you’re willing to embrace the changes to come. Today, as Mercury squares the North and South Nodes, you may taking stock of your life and seeing how the actions you’ve taken and decisions you’ve made have brought opportunities for you to change the course of your life. 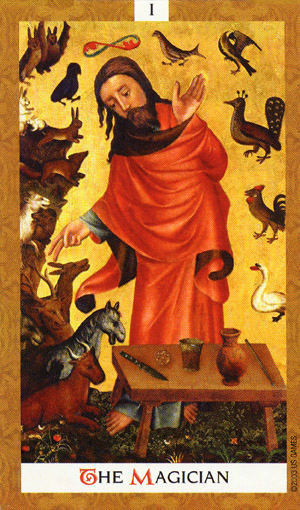 The Judgment card — this version from the Japaridze Tarot — represents a day of reckoning. It calls for self-evaluation and awareness, a need to develop enough spiritual altitude to look objectively at your mistakes and shortcomings as well as your triumphs and victories. It serves as a powerful reminder that in order to put the past behind us we must not only let go of prior judgments but heal the wounds that have been holding us back. It’s a card of both atonement and forgiveness. Of unconditional love, understanding and acceptance — for both ourselves and for those who’ve hurt us or let us down. This card refers to eternity, infinity and timelessness. It refers to the endless human journey that we sometimes refer to as “karma.” We reap and sew with each thought, action, and decision. This card represents a summation of all that has come before, and an awareness that each step taken — from here on out — leaves an indelible imprint on our future. On a personal level, this card speaks of compassion, forgiveness, understanding, and acceptance. Today’s Mars / Pluto square may see you at war with yourself and struggling to gain control over powerful urges and emotions. This aspect can be both volatile and combative. It pits the planet of anger and impatience (Mars) against the planet associated with intensity and power struggles (Pluto). 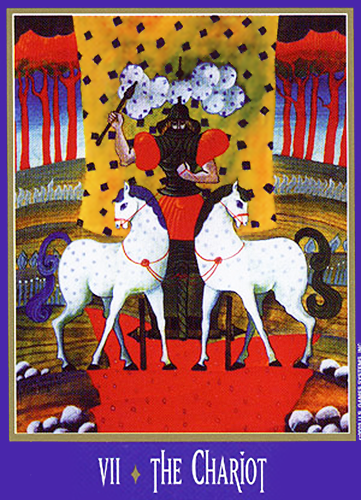 This is the New Century Tarot’s version of the Chariot card, which is associated with internal conflicts and upheavals that threaten to manifest outwardly. It speaks of the need to “pull it together” and exert control over your emotions, especially those that can erupt without warning and disturb the equilibrium in your life. This is a kinder, gentler version of the Chariot, with the stallions standing in one place — rather than rearing up violently or pulling in different directions. They do look off to either side of the card, a reference to this archetype’s difficulty staying in sync. The Mars/ Pluto energy is seen in the vibrant colors of the card as well as the Charioteer braced for action and ready to crack his whip. You may be called upon to both maintain control and harness the opposing forces in your own life today. Whether this is related to relationship, career, or the dual desires within your own psyche, the challenge will be to find a way to pull your energy inward and funnel it outward into one solid direction. You can accomplish a lot today through sheer force and determination — as long as you’re aware of the need to focus your energy in one primary direction. You’ll have find a way to balance the diverging energies in your life. But if you can “pull it together” you’ll make great strides toward accomplishing your goals. Today you want to work on gathering up the courage and confidence that are needed to go after your goals. You may be ready to chase after a ream you’d set aside because you lacked the time, energy or resources to follow it n the past. You may be reading to pursue an interest that’s been calling out to you that’s no longer possible to resist. Or you may be thinking about something (or someone) you’re passionate about that you’re only now in a position to pursue. 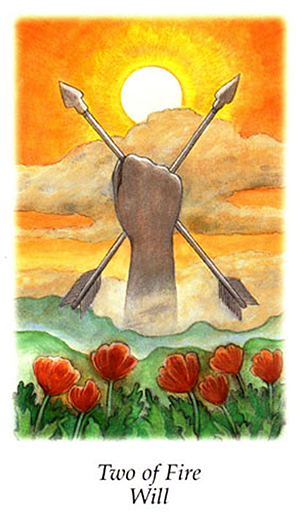 The Knight of Wands — this version from the Arcus Arcanum Tarot — encourages you to move past your fears and go after your dreams with the attitude that nothing can stand in your way. You don’t want to waiver or second-guess yourself; you want to grab onto opportunities that present themselves without a moment’s hesitation. If this is someone in your life, you will know him by his larger-than-life personality. You’ll know him by his act-first / think-later approach to life. And while he may not be off fighting battles, you’ll know that if he were, he’d come out on top. He may he here to teach you the importance of embracing some of these qualities yourself. If so keep in mind the importance of making preparations and pacing yourself so you don’t run out of steam. 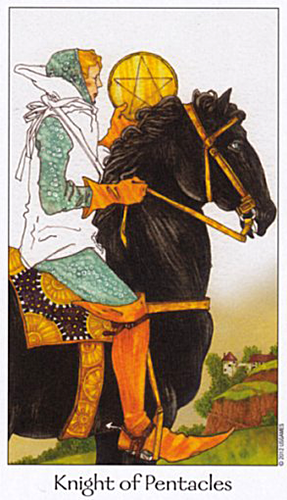 The Knight of Wands tends to run on adrenalin and has been known to lose interest in projects once they become routine. But overall he’s here to teach you how to challenge yourself to set your goals in motion. If you temper them with a enough discipline and perseverance, you just may see them come to fruition. No matter where you are in the world today, it’s a good day for giving thanks and for honoring those who have brought love, peace, joy and comfort into your life. It’s a day for counting your blessings and expressing gratitude for all that you have. It’s a day for gathering together with those you love and acknowledging their place in your world. The Magician card — this version from Kat Black’s beautiful Golden Tarot — refers to manifesting your goals and transforming them into something tangible and real. In this version there are symbols of love and acceptance — for all creatures great and small. The Christ figure beckons the animals that surround him with one hand and bestows on them the classic blessing mudra with the other. He honors them and acknowledges that he is one with them at the same time. The Magician card speaks of gathering together all of your resources and using them to create “magic.” As magic takes on many forms, it reminds you that you have everything you need right there at your disposal (notice the cup, the wand, the pentacle and the coin on the Magician’s table) to manifest your heart’s desires. Ask yourself: “What is it I have to give today?” or “What is it I have to offer?” The Magician encourages you to tap into your highest personal reservoirs and to access skills you may not even realize you have. Whether you are spending the day with loved ones or sending them powerful vibrations from afar, take some time today to remember how you got here and who has helped you along the way.